The final conference program is now available. View it here. Register here to attend the 2017 Australian Historical Association Conference, to be held at the University of Newcastle between 3 and 7 July 2017, hosted by UON’s School of Humanities and Social Science. The theme of the conference is ‘Entangled Histories’, to reflect the increasing move away from narrowly defined ‘national’ histories towards an understanding of History as an interlinked whole where identities and places are the products of mobilities and connections. Presentations will consider the value of entangled frameworks for analysis from all historical periods, themes and research areas. Prominent national and international keynote speakers and panelists include Professor Dane Kennedy from George Washington University, and Professor Christina Twomey from Monash University. The conference will also include streams from affiliated associations such as the Australian Women’s History Network; the Australian and New Zealand Environmental History Network; the Religious History Association; and Oral History Australia and the National Oral History Association of New Zealand. Image details: ‘Afghan people with an early make gramophone, c. 1910’. This photograph was probably taken at Marree. Courtesy of photographer, Alice Mary Hopewell. Image courtesy of the State Library of South Australia. 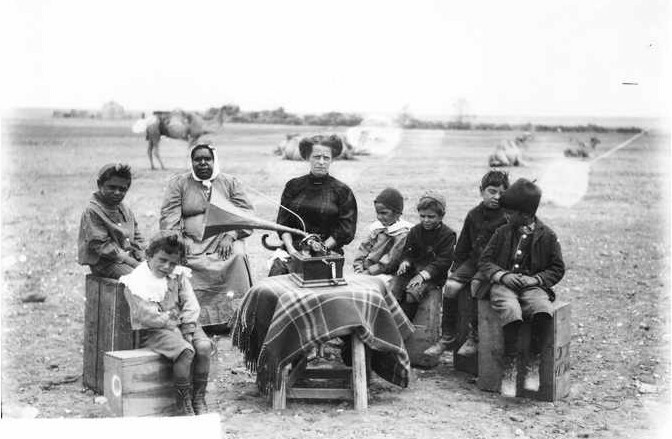 Every effort has been made by the State Library of South Australia to contact the Indigenous descendants in the photograph.